Each bill has a link to the state’s legislature page for the bill, followed by Bill Type and Bill Status, and possibly some additional explanation or status information. Exempt DST – Intent to exempt the state from DST. Year-Round DST – Intent to adopt Year-Round DST. Safety – Typically a resolution intended to remind citizens to be extra careful around the changing of the clocks, get good sleep, drive carefully, etc. Other – There is always something out of the ordinary! AB 807 – Other, Committee. Recommended “Do Pass” 3/30; Second Read and Amended 4/3. Proposes a state-wide vote to repeal the initiative that created the Daylight Saving Time Act, which was created approved by California voters 11/8/1949. This would pave the way for the CA legislature to make changes to the state’s DST rules, which at this time are bound by the 1949 initiative. 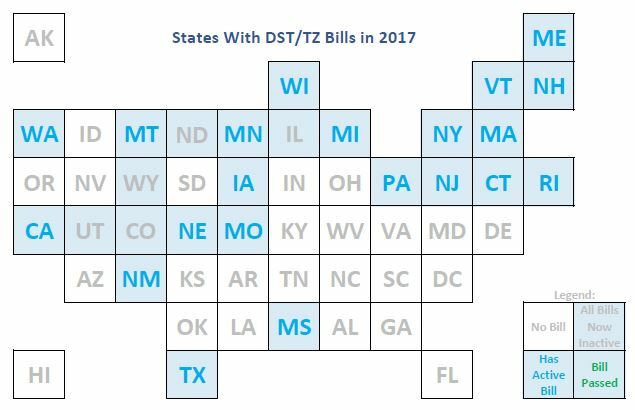 While this bill wouldn’t of itself make any immediate changes to the state’s DST rules, it is a necessary precursor to doing so at a later date. HB 1118 – Exempt DST, Failed. House Agriculture, Livestock, & Natural Resources committee voted 2/8 to postpone indefinitely. SB 33 – Year-Round DST, Committee. There was a public hearing 2/27; no specific status changes since that date. HB 5734 – Exempt DST, Committee. Bill would “require the state of Connecticut to remain on standard time and not observe daylight saving time”. HB 3129 – Exempt DST, Failed. Re-referred to Rules Committee under Rule 19(a). HB 424 – Year-Round DST, Failed. Re-referred to Rules Committee under Rule 19(a). HF 206 – Exempt DST, Committee. SF 168 – Exempt DST, Committee. LD 203 – Exempt DST and Change TZ, Committee. S 1720 – Safety, Committee. House concurred, senate referred to Joint Committee on State Administration and Regulatory Oversight. Proclamation “relative to sleep deprivation avoidance and promotion of good sleeping practices” at the start and end of DST. S 1905 – Safety, Committee. Similar to S 1720. H 1700 – Safety, Committee. Similar to S 1720. HF 2458 – Exempt DST, Filed. HB 307 – Year-Round DST, Failed. HB 449 – Year-Round DST, Failed. SB 229 – Other, Committee. This bill doesn’t deal directly with DST or TZ. It “exempts the first Sunday of November each year when Daylight Saving Time ends from current law requirements that limit the number of hours a state employee may work in a 24 hour period in certain secured mental health facilities”. On the Senate Consent Calendar. HJR 5 – Exempt DST, Failed. Last action 1/5 and not on a House calendar probably means this bill is Failed, though it is not listed as such on the legislative web site. SB 206 – Exempt DST, First Reading (House). This bill has passed in the Senate, now is referred to the House, with first reading 2/24. LB 309 – Exempt DST, Committee. Notice of hearing for March 3. HB 209 – Change DST, Committee (Senate). Text: “This bill provides that, if Massachusetts adopts Atlantic standard time, the state of New Hampshire shall also adopt the Atlantic standard time, the effect of which shall be to make DAYLIGHT saving time permanent in both states.” Passed in House, referred to Committee in Senate. SR 90 – Urge Congress, Passed (Senate). This bill makes a limited request to Congress and the President, to extend DST until the general election. Search for SR90 in link. SB 239 – Year-Round DST, Committee. Do Pass recommendations from SPAC and SJC. SB 2167 – Exempt DST, Failed. A 6937 – Exempt DST, Filed. Referred to Government Operations Committee. SR 31 – Safety, Passed. This is a “Resolution recognizing the week of March 5 through 12, 2017, as “Sleep Awareness Week” in Pennsylvania.” Adopted by the Senate. HB 2400 – Exempt DST, Filed. A “late file” on 2/24. HB 95 – Exempt DST, Committee. HJR 2 – Exempt DST (Vote), Failed. This would put the question of being exempt from DST to a non-binding vote of the people. JRS 28 – Urge Congress, Filed. The ext of the bill is not available online, but the title of the bill is: “Joint resolution demanding that Congress abolish daylight saving time”. SB 5329 – Exempt DST, Committee. Public hearing was held 2/1; no status since may mean the bill is dead. SF 125 – Exempt DST and Change TZ; Failed. Proposes to go on Central Standard Time, then exempt the state from DST. But then goes on to say they’ll call their time “Mountain Daylight Time” all year long. HB 141 – Exempt DST, Failed. 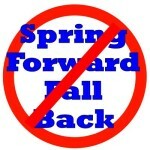 HB 49 – Year-Round DST, Failed.